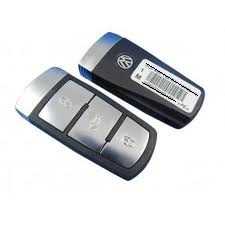 Product Information: This is for the supply, adaption, cutting and programming of a genuine brand new Volkswagen key which includes the remote fob and blade specific to your vehicles specification. For this service you are required to have all available vehicle keys present for the duration of the service. This is due to the manufacturer specific procedure which when one vehicle key is to be programmed all vehicle keys must be programmed disabling any lost or damaged keys. Please note we will need to view the vehicle log book and a valid form of photo ID to complete the order which can be viewed on the day. Below example of complete keys.